Yep, this again. Apparently one of the routing engines uses the directional roles for relations to tell you what ramp you take (e.g. 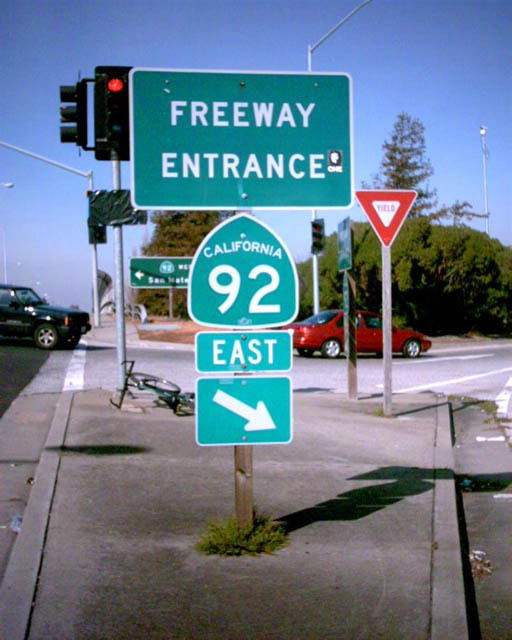 for ​http://www.aaroads.com/california/images092/ca-092_freeway_entrance_eb_hayward.jpg you put role east on the SR 92 relation and it says merge into SR 92 east). But JOSM only sorts the forward and backward roles, so it's impossible to find and fix common errors (such as ways being the wrong way) with directional roles. I suggest as a quick fix that forward:* and backward:* be treated the same as forward and backward. So you could use "forward:east" as the role and the routing engine would parse this. In the longer term, better support could be added that allows simply east, but this would require checking oneways and such to make sure it's all routable. ​http://www.openstreetmap.org/browse/relation/929422 is an example of a relation that uses directional roles. I give no guarantees that it's complete.